Sierra Leone, as one of the countries of the African continent, attracts terminators with a high rate and cheap cellular communication. With an average rate of $0.18 per minute, an entrepreneur can effortlessly make money on the difference in the cost of international and local calls. But what about the situation with access to the Internet in Sierra Leone? After all, for efficient termination of voice traffic, you need a stable Internet with a minimum speed of 42 Kbps per channel. The Internet penetration rate in Sierra Leone is 11.8% as of June 2017. This is approximately 792.4 thousand connections. 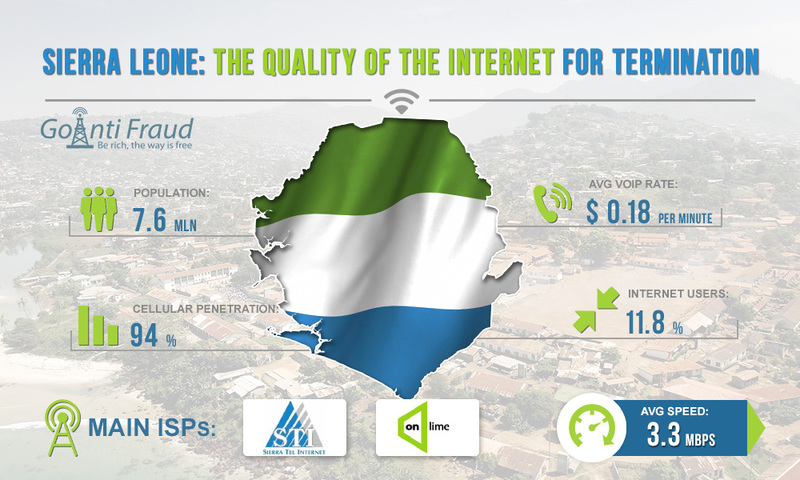 The Sierra Leone telecommunications market remains one of the least developed among sub-Saharan African countries, and the Internet services sector is no exception. One of the reasons is the poor fixed-line infrastructure; however, the situation is gradually improving. By 2013, the country was completely dependent on satellites for international connections. However, the connection to the underwater ACE cable has significantly improved the capacity of local networks. In addition, at the end of 2015, a backbone network linking Sierra Leone with Guinea and Liberia was laid. To date, the country provides the opportunity to connect the Internet, the speed of which is sufficient for voiceall voip termination. The average download speed in Sierra Leone is 3.3 Mbps. The major Internet providers are Sierra Tel and Onlime. Local Internet service providers offer connectivity using various technologies (cable, satellite, fiber, wireless, and dial-up). Coverage is not very good in rural areas, so we recommend placing the equipment in large settlements.